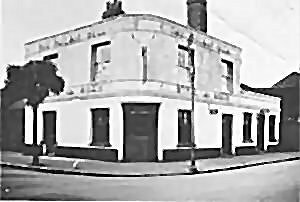 This small calling card shows the "Railway Bell" public house. The card is believed to date from the 1950s. 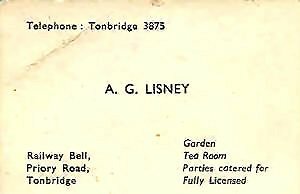 The landlord of the "Railway Bell" at 25 Priory Road in Tonbridge was at one time Archibald Glenny Lisney. He ran the establishment with the help of his wife Maud and son Terry. Reverse side of the calling card.